Home/Blog/Silly Goats’ Puts Sweet Almond Oil In Our Lotions! We Are Nuts About Pure Sweet Almond Oil, In Silly Goats’ Lotion! 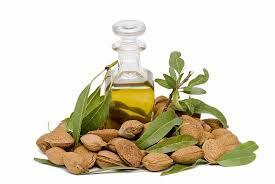 Sweet almond oil is pressed from the dried kernel of sweet almonds and is rich in omega-9 and omega-6 fatty acids. Traditionally used by massage therapists to enhance their client’s experience, it also makes the external layers of skin softer and more pliable. It increases skin’s moisture level by limiting evaporation and is rich in Vitamin E and other nutrient rich lipids. Besides aromatherapy and massage, our sweet almond oil can be used for cooking. Its full of monounsaturated fats and is similar to olive oil in frying or sautéing a healthy, delicious meal. Your hair can benefit by being stronger, thicker, and shinier, while medicinal uses might surprise you. Using as base oil for soaps, in lotions and for aromatherapy, it brings the vitamins D and E directly to the epidermis and is suitable for all skin types. The almond tree’s domestication is thought to have been sometime between 3,000 and 2,000 B.C. Originally native to the Middle East, the United States has become the world’s largest producer. Commonly used in Ayurvedic medicine, sweet almond oil is thought to bring the body back into balance. The almond itself is the fruit of a tree, technically considered a drupe it is not a nut. The ancients found it so important, they included it in their religious rituals. The ancient Egyptians believed in an afterlife in which they were able to bring with them earthly possessions. Almonds were discovered in the tomb of King Tutankhamun and must have been considered worthy of royalty. To this day, some of the finest woodwind instruments are conditioned with sweet almond oil. If you are planning on high heat cooking, make sure you a natural oil rich in nutrients. Cold pressed allows for more of a “nutty” natural flavor to come through. Try replacing ¼ to ½ cup of the oil or butter, called for in your traditional recipes, with cold pressed almond oil to add a slightly nutty flavor to the dish. The more used, the richer the almond flavor. Drizzle over salads and add sliced almonds, or drizzle over an almond crusted fish to enhance and supplement a healthy balanced meal. One tablespoon of sweet almond oil provides twenty five percent (25%) of the daily amount of vitamin E needed. Besides decreasing bad cholesterol and increasing the good, it can also aid in the digestion of nutrients and also help maintain healthy brain tissue. Lighter and thinner than olive oil, sweet almond oil is great for protecting and adding shine to hair, while at the same time smelling wonderful. Try using it as a pre-conditioner to washing, conditioning and styling in order to prevent split ends. Add after styling to prevent frizz and add shine. As a versatile moisturizer, try massaging it directly into the roots to help ease the symptoms of dry scalp. While these benefits are already scientifically known, some believe that it can actually stimulate growth and lead to fuller and thicker hair. Already a common carrier oil and base for skin lotions, try adding it to your own homemade natural skin care products. Excellent for every skin type it will calm itching, chapping, dryness and inflammation. Incorporate into your lip balms for a natural source of vitamin E and plump, healthy lips. Smooth away fine lines and wrinkles my gently rubbing sweet almond oil around your eyes and lips until absorbed. Gently splash water on your face to rinse without irritation. Almond oil doesn’t penetrate skin as deeply as other oils and therefore is perfect for aromatherapy. Infuse with your favorite essential oil to create your own personalized perfume that will last for years. Try mixing it into your warm bath water for a stress reliving and skin moisturizing luxurious bathing experience. Add lavender and rosemary for a pain relieving massage on those tired feet and achy back. Come look at our complete line of oue Natural, Goats Milk Lotions. I bought Goats Milk Moisturizing Lotion, Oatmeal & Honey. I love it, makes your skin feel so soft. I also bought the Cooling Joint & Muscle Rub and that works great. I have enjoyed all the products I have bought from the Silly Goats Soap Co. I would highly recommend trying there products. I just love your products. Your oatmeal/honey lotion is my go to for my sensitive skin. I have also started using the soap. Your products are fairly priced, orders are filled quickly and shipping is never a problem. Thank you for providing such excellent products. You are so welcome! And thank you for that follow-up order! You are going to be a loyal customer aren’t you. We are so happy to hear from people,l like yourself, who love or products. It really makes it worth while when you hear that other people that appreciate and are getting the benefits of goat’s milk, and all the other awesome benefits of the natural oils we put into our products!